Hi! Lucy Jessica Hartley here with something mega-ly exciting to tell you! They're making a movie right here in my town and I'm going to audition for a part. How totally cool is that?!!! Right, must go this second and create a fab outfit to make me stand out on screen - fingers crossed that gorgeous Daniel Blake will notice me too! 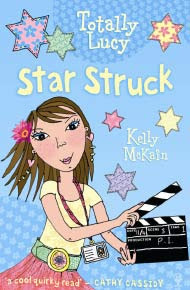 Share the star-struck swoonings of soon-to-be teenager Lucy Jessica Hartley as she deals with demanding directors, costume catastrophes and fame-crazy friends. The drawings in this book are so cool, and they seem to look slightly realistic at the same time as looking illustrated. I love the clothes Lucy wears and they have been drawn brilliantly. The illustrations are by Vici Leyhane and I think she's done a very good job - Vici, you rock! Also, the storyline is, while not so original, still enjoyable and it still manages to have you waiting in suspense for the next thing to happen. I really liked the way the book was set out in a diary format, with a date, time and where she was at the top. I also liked the way some of the words were written in a handwriting font, and there were real looking photos stuck in too to make it look like a real, proper diary. My favourite character was Jules, Lucy's best friend. Sometimes she was moody and rude, but other than that she was, well...a character you liked to dislike! And when she wasn't being moody and rude, she seemed really nice. I have no complaints about this book except the length of it! For me, it was too short. I was really sad when it ended - but then I cheered up because there are 9 more, as Jessica would say, 'fabulissimo' books in the series! My rating of this book is 5/5, I really enjoyed it and recommend it for ages 9+ but I reckon it would still be enjoyable for older girls too. And just girls, because I really don't think this would be a boy's kind of book at all! !